In my recent blog redesign I added the “Start Here” categories on the left sidebar to make it easier to find articles with basic information about self-publishing. Each introduces a stage on the journey to publication with links from the archives of TheBookDesigner. This is the eighth and final installment in the series, and I hope you find something in these articles to enjoy and profit from. You’ve arrived at the end of your journey to publication. Slowly the realization dawns that you have now transitioned into being an author/publisher. As you promote your book you’ll start to connect with the wider community of indie authors and self-publishers. This is a rapidly-growing cohort of people who have traveled a similar path. 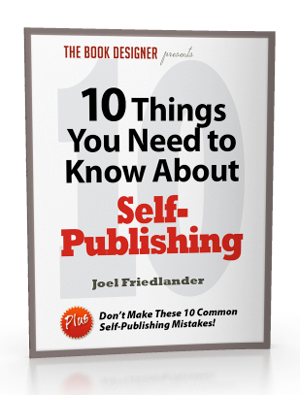 It surprises a lot of new self-publishers to arrive here, and realize that all the work they have put in—sometimes for years—is actually the introduction to a much larger world. As an indie author you will keep learning about book marketing and promotion opportunities. Part of being a self-publisher is having an activist mindset. You are tuned into your niche, your genre, or your subject area. You know what’s happening and who the players are. One day you’ll be surprised when an author who is just starting to think about self-publishing starts asking for your advice, leaning on your wisdom. Indie publishing is a field full of helpful, active, intelligent people. You had the drive to write, publish and market your book, and that sets you apart from many people who only dream of doing what you’ve done. Hearing from other self-publishers is a powerful way to connect to the drive that’s common in us all. A lot of our interaction takes place at industry events and workshops, and like many self-publishers you’ll find these groups and their online counterparts powerful tools in continuing your education. Networking online and off also opens you to co-publishing ventures, leads you to skilled vendors for your books and marketing projects, and helps you address the inevitable questions that occur in this fast-changing environment. Of course, although our book is finished and on the market—and hopefully selling well—there is more writing to do. It’s long been my feeling that the best way to make your publishing program a success is to take what you’ve learned and start on another book that can be sold to the same people who are enjoying your first book. There are lots of things to keep up with in the changing world of publishing, and lots of ways to do it. One of the great things that has happened as a result of the growth of self-publishing is a gradual fading of the “stigma” self-published authors have been fighting for a long time. But it’s gradual, and there are times when it seems that we are only getting reluctant acceptance. Indie Bookstores and Indie Publishers: On The Same Page? Thanks for traveling a little way on this road with me, and I hope I’ve been able to speed you on your journey. May you publish well, and with satisfaction. You deserve it. I just published my book, and it was an incredible feeling to hold it in my hands and to see the listing on Amazon, but the most scary, amazing feeling was knowing that it was out there, in Arizona and Pennsylvania and Wyoming and that people I had never met, were seeing the story that had, until this point only been between my mind and a few family and students. I thought that I wouldn’t care what they thought, because I’d written it for my sons and myself, but surprising only me, I do care a lot. As you said, it is amazing how accepting and encouraging established people have been, and recently I was attending a writer’s conference, and during a break, found myself surrounded by people with questions for ME!!! and even more amazing, I had some answers and my voice did not shake! Duffy Barkley is Not a Dog. Dixie, that’s a once-in-a-lifetime experience and I’m excited for you to have your book out in the world. And I’m sure you’ve learned a lot on the way. I remember the day I first saw my self-published book on the shelf and for sale at a bookstore. Thanks for brining back that memory, and for taking the time to comment. I agree with Michael; almost everyone in this business is gracious and willing to help (within reason, of course). I’ve had a lot of success this year, but I’ve also had a lot of help! Running a publishing company is a 24-hour job. I was up until 2AM last night and I’ll be up at 8AM tomorrow again. But it’s soooo worth it! I’m my own boss, and when I need to stay home because I’m sick or my son is sick, I can do it. I hope it never ends. It’s my pleasure, Margreet, thanks for reading. I hope your day is spectacular! One thing that both surprised and greatly pleased me when I started self-pubbing in mid-2008 is how cooperative the community is. Veterans help newbies–even if the newbies are developing similar books aimed at similar audiences. One of the first books on publishing I bought was Morris Rosenfeld’s “Print-On-Demand Book Publishing.” I bought only one book he wrote, with a cover price of $14.95 that probably generated only a few bucks of profit, but Morris still found the time to respond to several of my emails quickly, courteously and completely. He amplified a topic in his book to help me in my own self-publishing effort. Although my first book was a humorous memoir and has nothing to do with self-publishing, Morris kindly reviewed a PDF of my fourth book, which was about self-publishing, and made some important suggestions. I have since tried to follow Morris’s example and I help newbies who are newer than I am. All writers (and probably all people) can teach to and learn from each other. Well said, Michael. We all “stand on the shoulders” of people who’ve gone before us. One of the indelible secrets of life is learning how to learn from anyone and everyone. I was out of publishing for a few years, and I sorely missed that collegiality and the sense that we are all in this together. In other industries this is simply not the case. Thanks for your comment.